Jerry is really personable. I mean, you’ve got to like Jerry Jones. If you’re around him, you’ve got to like him, unless you hate the Dallas Cowboys, which some people do. But as a person, he’s likeable. He’s fun to be around. His whole family is working with the team. They are a great family. I’m partial to family, myself. Jerry Jones expects you to win the Super Bowl every year. He just puts a lot of pressure on his team to go to the Super Bowl and win it. He’s won it three times before. He wants to win it again and again. And that’s the other good thing about him. Some owners want to win, but they don’t want to give the up-front bonus money to allow you to pick up the players to get it done. Jerry’s willing to do that, so I thought he was a good owner in that sense. If he had a Drew Brees, he was going to keep him, whereas San Diego let him go to get somebody else while Drew established himself as a Hall of Famer with the Saints. Jerry was willing to go out and get a guy like Terrell Owens, who also has Hall of Fame credentials. If you could convince him that a guy was going to help the team, he would pay the money to get him. Terrell’s personality rubbed people wrong. He was seen as being selfish, but I liked him because he worked hard and he played hard. I had been around selfish players before, but if they played hard, worked hard, that was a redeeming quality to me. Terrell had some great years in Dallas with us. He’d play hurt. He didn’t know how to say the right things at times. There were a lot of people against him, but I wasn’t one of them. Jerry has certain ideas on things and you can go with it or tell him you don’t like it, one or the other. He didn’t mind you telling him you didn’t like something either. He listened. Now once he makes up his mind on certain things, he’s the boss. If he decided he was going to draft a certain player, he was going to take him, no matter what you or anyone else said. When I joined the Cowboys, they already had an offensive coordinator, Jason Garrett. He had been the quarterbacks coach for the Miami Dolphins before they fired their entire coaching staff, which made him available. Once the season began, I liked what we had on both sides of the ball. We went 13–3, which was the best record in the NFL, and had a top-ten defense. We lost to the Giants in a home playoff game. We had the ball at the end of the game with a chance to win, but they stopped us. The Giants went on to win the Super Bowl, so you’ve got to think if we would have won that game, we might have won it all. You never know, because we had a really good year. With one year left on my contract, I had my agent ask Jerry for an extension on my deal. It seemed like things were good, but they weren’t. Or at least, they weren’t good enough. The year before, when we went 9–7, the press wanted to fire me. Now here I was, with a 33–15 record and a playoff win in three seasons, and coming off an 11–5 year. I thought I’d get Jerry to extend my contract beyond the 2010 season. But he wouldn’t. Another factor was Jason Garrett had some head coaching opportunities. He got an offer from the Baltimore Ravens [in 2008], and his agent evidently went back to Jerry and said, “If you give him what Baltimore is paying him as a head coach, he’ll stay in Dallas as offensive coordinator.” Jerry matched the offer and now Jason was making more than me. “That just doesn’t seem right to me,” I said. After our 9–7 season, when the offense struggled, Jerry said that maybe he should have let Jason take the Baltimore job rather than give him the big raise. Jerry did agree to give me more money. He did it by adding an option year to the two remaining seasons on my contract. It included a bonus that would only be paid if I finished the season as head coach. “Well, then that’s not giving me another year if it’s your option,” I said. I took the deal, although I still didn’t think it was right. Jerry can do what he wants to do as owner, obviously. I just didn’t think it was right that an assistant coach was making more than a head coach. He could have paid me more. He had plenty of money. Still does. But he’s a businessman and his business side made that decision. We ran a play and we got a ten-yard holding penalty. There were only four seconds left in the half. Jason called a pass. Tony Romo threw to our running back, Tashard Choice, who was four yards behind the line. DeAngelo Hall hit him; he fumbled; Hall picked up the ball and ran it in for a touchdown. I didn’t know Jason was going to run a play after having a ten-yard penalty and only four seconds on the clock instead of kneeling on the ball, which was what we should have done. We hit rock bottom in our eighth game when we went to Green Bay and lost 45–7. It was one of those situations where if you get beat by a good team on the road and a lot of things go bad for you, the perception is you’ve lost the team as the head coach. Everybody’s saying that. They think that. For road games, I would fly out with the team but always fly back with Jerry on his private plane, mainly because he wanted to use that time for just the two of us to talk and to hear about what happened in the game from the coach’s perspective. On the way back from Green Bay, I gave him my thoughts about the game, although I knew that he was hearing the same thing that was being said pretty much everywhere—that I had lost the team. I asked him if I could stay on the job for one more game because I felt I would have a chance to go out on a winning note. We were playing the Giants on the road, and I said he could make the change after that game and start fresh with a new coach for our next game at home, which would be a week after the New York trip. Jason Garrett took over and the Cowboys won the next two games and ended up with five total victories to finish the year 6–10. I felt like—and I still feel like—we could have won those last two games as well. You never know when it’s going to turn around, but that didn’t happen. One of the first texts I received after being fired was from Terrell Owens, who Jerry had decided to let go after the 2009 season. “I think you’re a great coach, and I really appreciate what you did for me,” Terrell said. I hadn’t had many players do that and I had been coaching for a long time. Players say nice things later on, or when they see me, but Terrell went out of his way to tell me that he thought I did a good job. At a time like that, when you’ve just been fired, it makes you feel a lot better. I also felt good about my 34–22 record with the Cowboys. It’s not tremendous, but it’s still pretty good. That’s still the tiniest of a fraction of a percent ahead of Tom Landry, the all-time winningest coach in the history of the franchise. People don’t want to hear that, but it’s a fact. There really is no other head coaching job like the Dallas head coaching job—football fans in Texas are crazy about their teams. I was exposed to that being around my dad and the whole “Luv Ya Blue” era in Houston. We went 10–6, 10–6, and 11–5 with the Oilers, and still got fired. We were one of the winningest teams in the league for those three years, so that showed me that anything can happen. It all comes back to the fact that the guy who owns the team can do whatever he wants to do even if you don’t think it makes a lot of sense. 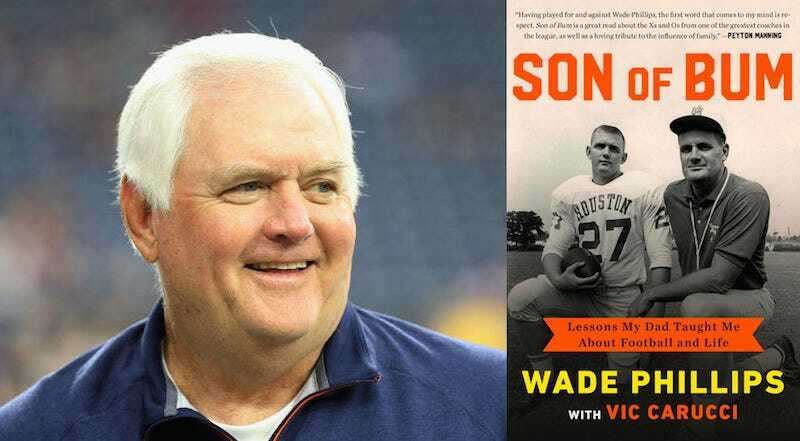 Wade Phillips is the defensive coordinator for the Los Angeles Rams. This piece is an adapted excerpt from his new book with Vic Carucci, Son of Bum: Life Lessons My Dad Taught Me About Football and Life. It is reprinted with the permission of Diversion Books. Buy it here.